Going down the fully DIY route for album number two sees Oh! Gunquit self-releasing Lightning Likes Me and stage managing all their own promotional activities. That cover's certainly a less slick effort than the one adorning debut Eat Yuppies And Dance but what of the tunes behind those eyes? You'll be glad to know that nothing has changed in the music department - the band are still something-a-billy or other with a dash of the B52s and the Pacific Northwest swirled in there. 'Nomads Of The Lost' and 'Fireball' have been doing the rounds on soundcloud for a year or so, which gives you some idea of the time and effort involved at this level of the industry. The fun and energy exhibited right from the band's earliest days is still there in spades and the ten songs of Lightning Likes Me amply display the talents of all of those involved in their conception and realisation. The saxophone underpinning is a particularly important element throughout the album, lending most of the songs a freshness that so many groups lack, no matter the musical camp or camps in which they pitch their tents ('Suzy Don't Stop' standing out especially). An already strong act here ably confirm that they're still approaching the peak of their powers with a solid second full-length release, even partially channeling Captain Beefheart & The Magic Band on the penultimate track 'Greasy Moves'. Speaking of camps, one festival you don't have to camp at is the 2017 Franklin Fest in Edinburgh over June 29th - July 1st, where Tina from Oh! Gunquit will be onstage in her Cramps cover act Das Clamps and Simon from the band will be performing solo under his Professor Baba moniker. Head along and see the two next best things to experiencing Oh! Gunquit themselves. Lightning Likes Me is available from bandcamp. It's been another great year, and it got off to an amazing start with The Senior Service's cracking debut single, 'Depth Charge' (my favourite single of 2016), followed by their debut live performance at the Half Moon, Putney. It certainly exceeded my (already high) expectations. And, for those who don't know, the Senior Service have ex-members of The Prisoners, JTQ, The Solarflares, The Prime Movers to name but a few. The whole event was organised by Steve Worrall of Retroman Blog who definitely deserves a mention for all the hard work he puts in to organising these regular events, with such quality acts. Where would we be without you? I doff my cap to you sir. 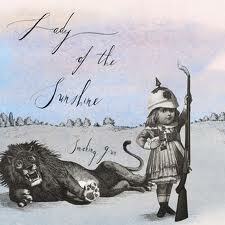 Their LP The Girl In The Glass Case is beyond sublime. June saw the return of the Franklin Fest in Edinburgh (review here) which once again was a blast. Well done to the organisers again for supplying us with acts from further afield, such as the mighty Courettes, Thee Jezebels, The Embrooks, The Sine Waves and Oh! Gunquit. Also making their debut were garage lovelies The Nettles and The Gastronauts, featuring frenzied frontman Spencer Envoy of MFC Chicken. 'Scotch Egg' anyone? A fantastic weekend and I'm already looking forward to finding out who will feature in the 2017 line-up. The best Halloween party in town was hosted and headlined by Geek Maggot Bingo, featuring The Fnords & The Reverse Cowgirls. Showing us that local talent is just as good as the more well-known names mentioned above, and of course they were all part of the Franklin Fest too. Lord Rochester played the early December Franklin R&R Club, and they really knocked me out. Maybe something to do with playing at the more attractive end of the venue? Their success lies in their simplicity. A minimal drum kit, sing-a-long swing-a-long tunes, with added bite. We also gratefully received an extra helping from The Gastronauts, with their second appearance at The Franklin this year. On form and as eggs-elent as before. The only downside to this year is that I haven't really travelled far afield due to other commitments, so missed out of a few festivals like The Medway Legends Weekender and The Green Fuzz Weekender (both in Spain). Hopefully next year will be different, but I can't really complain, as my home town (Edinburgh) has such a great scene, and I for one, am very grateful for that.